Another great thing about cooking your beef in the slow cooker, is it also means that you can use cheaper cut of meat like brisket. This is because the slow cooker cooks it until it is tender and falling apart. 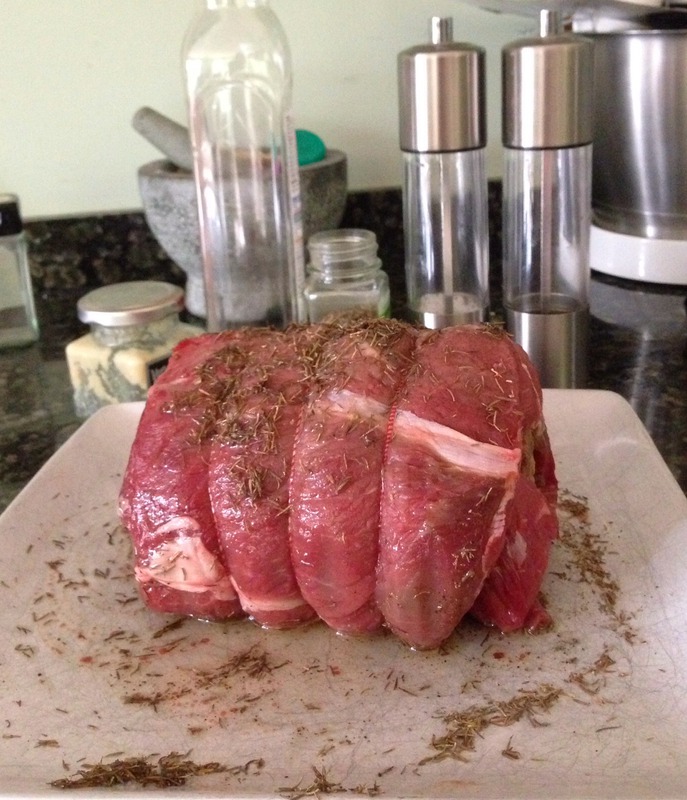 Therefore, slow cooking your joint of beef is not only easy, but it can save you money too. This method for slow cooker roast beef is my own recipe. It is a method I have been using for many years for my family. As a result I wanted to share it, because Sunday dinner can take time to make and prepare, so by slow cooking the meat the slow cooker is doing to hard work for you. This means less time in the kitchen and less washing up – all of which are big pros for making slow cooker roast beef for me! Now my family prefer their slow cooker roast beef cooked well done, so this recipe is based on that cooking method. However, if you wanted it rarer I would suggest you cook it for less time. I have also cooked this on the high setting of my slow cooker for the purpose of this post. Therefore, if you were to want to cook your beef all day, then make sure you use the lowest cooking setting on your slow cooker. 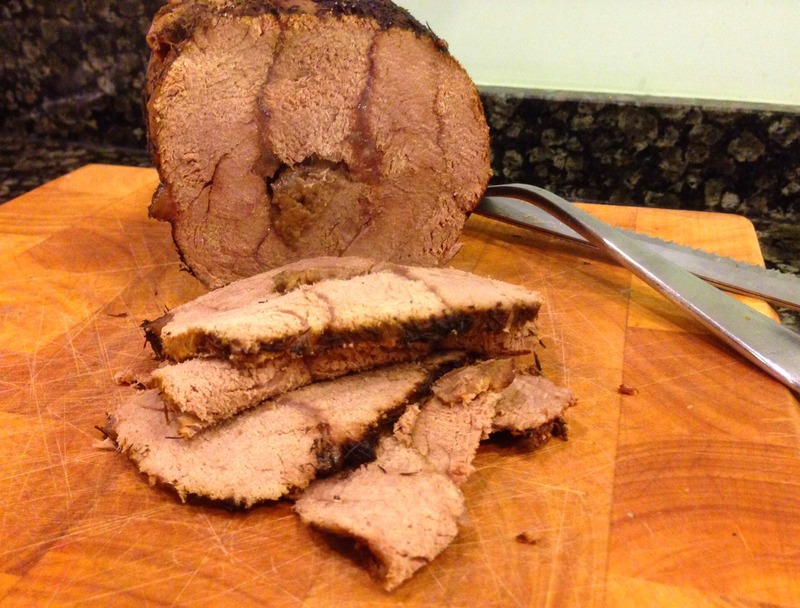 Here is a video showing you how to make slow cooker roast beef step by step. Below the video is a step by step guide with the ingredients and method included. I usually use a joint of beef that weighs approx 1.5kg . If you use smaller or larger piece of beef, then you will need to reduce/increase the cooking times accordingly. when its cooked to your liking remove the beef and leave to rest. If you like a lot of gravy then you will need to make some more using gravy granules/instant gravy to add to the slow cooked one. Serve your slow cooker roast beef with your sides, and delicious gravy, and enjoy. 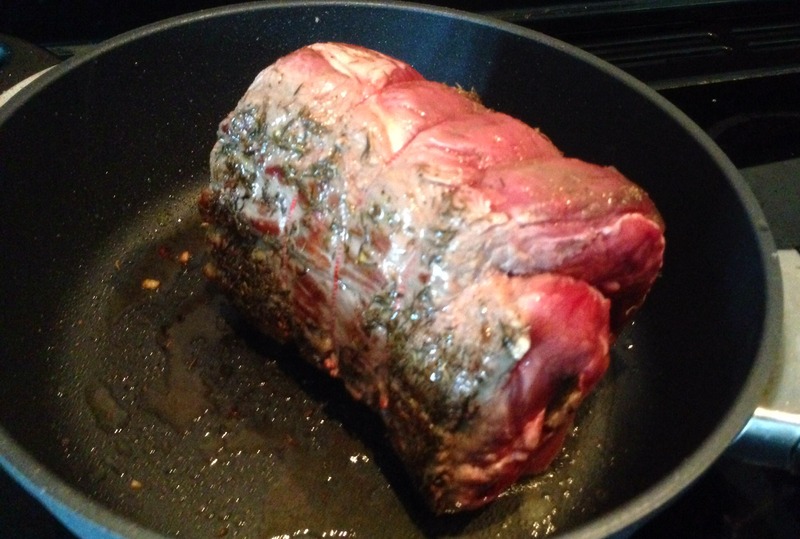 Maybe serve this slow cooker roast beef alongside my beer battered Yorkshire puddings. Once you have tried slow cooking your beef this way, you will probably never use an oven again! I just find it such an easy way to ensure tasty and tender beef, and I love that it takes such little effort on my part to produce perfectly cooked meat for my family. After all, a Sunday is a day of rest for Mum’s too …….. well almost! For more tips on healthy ways to eat your food, check out this article. Thanks for making Sunday fab today! Wow this looks gorgeous, I am drooling, I shall definately be giving this a go, can I ask how Red was the meat after 6 hours ? That looks amazing! I’ve always been tempted to have a go at a roast, now I’m convinced. Thanks for taking part in Slow Cooker Sunday and hope to see you next week. Yum! Will have to try this now I have a slow cooker. Ok not sure if this is a daft question here but is the meat brown all the way through oming out of the slow cooker ie well done? I dont like pink on my meats? i used 2 oxo cubes in a pint of water, after 6 n half hours on low drizzled with oil n put in oven for 10 mins with silver foil placed ontop of it, turned n final 10mins, left to set n enjoyed with drained s/c juice! i shall use my s/c for beef from now on! it was best and easiest way i have cooked beef. try it!!! I found this on google and I’m gonna do my christmas beef in the slow cooker. Your photo looks fab even before plating up. I think I wouldn’t remember either because I can almost smell it. Thanks. Some recipes say you dont have to put water in at all but as I havnt used a slow cooker before I was unsure ? I am cooking my first roast tomorrow n defo trying this, thanks been trying to find a nice easy way off cooking my brisket. i love my slow cooker, i too cook a joint of beef in it, or lamb or pork, i normally thow it in with some golden syrup or honey or redcurrant sauce and leave it cooking on low for 8 hours, very easy and it tastes amazing! Hi this sounds so lush I’m going to do it today although it says to put it on for 6 hours but is that on the high setting or low setting on my slow cooker?? Thank you so much for this. Did this for Christmas dinner and was fabulous. Redeemed myself with the beef because my turkey was awful, overcooked and ruined,so will have to learn turkey cooking for next year! Have got a piece of gammon…….do you think this would work in the slow cooker too? Anyone else tried this? to slow-cook gammon try topping up with cider – and bay leaf. or ginger beer and kumquats…. Am cooking this as I send this. Was very easy to follow and if the smell is anything to go on will taste wonderful. 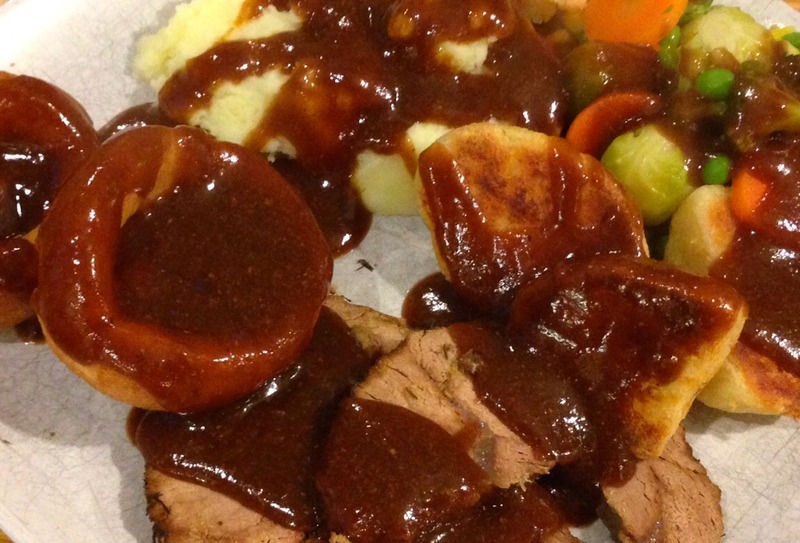 We like lots of gravy with our beef so have added an extra half pint of beef gravy granules! Thanks very much. Oh wow, that does look delicious! And that gravy is amazing, I’m going to try this out the next time we have beef. Followed this recipe, custom sauce, including red wine, cooked for about 4.5 hours. Didn’t have to cut, fell apart, very tender and marvellous flavour. How big was your joint of beef please? Best beef ln slow cooker dash of red wine 7hours on low result not happy followed recipe to the letter roast next time billbandit? Definitely going to give this a go for my family on Friday … Nervous though! Ooooh Jenny, that looks amazing. I love slow cooked meat. I’m glad I found this. My cooker is broken and cooking Christmas dinner would have taken a million years in it. I was just wondering how much water do you put in? Hi, i am keen to try this for Christmas dinner this year, my joint of beef is 1.623kg, how long shall i cook this for on a low or medium setting and with how much stock? I normally slow cook a piece of beef which is around 1.5-1.7kg and for this I cook for 4-6 hours on low – 6 for well done and 4-5 for medium. Then i simply add just 1/2 pint of beef stock – you can add some red wine also if you wish. Remember to sear the meat first as per my method to seal in the juices. My beef has just gone into the slow cooker, after searing of course. It weighs 2.4 kg and is to serve eight. We plan to eat about 4.00pm. i.e about 7 hours. Will that be long enough on the low setting? I would rather not have it pink. Should I turn up the heat? Thanks. I turned it to high and left it in for an extra hour. It was a roaring success. Trying my ‘slow cooker’ for the first time with a piece of beef. Does it need to be turned over halfway through cooking? Thank you – will do so! Hi just wondered what weight of beef to buy fo make this. I too have two kids and one hubbie!! It depends if you want left overs as to what size you buy, but I would suggest that for a family of 4 with leftovers a 1.2kg piece would do the job. if it is just for the one meal then a 1kg size joint would be fine. But I am no expert this is just based on what my Mum said!! Jenny – looks fab, thanks. one question. By searing the meat first, aren’t you preventing the juices from escaping and so are left with less gravy? I only ask because I’ve seen other recipes which rather to oven cooking at the end rather than searing at the beginning. Has anyone done this overnight? Am wanting to serve for Sunday lunch, but don’t want to have to get up at the crack of dawn. What happens if it cooks for longer? Hi, I tried this recipe with 1.4kg of topside beef and I found the meat very dry. Tender but dry. I don’t know if this is because it’s topside as I usually buy silverside. Sometimes I find sealing the meat first tends to dry it out or maybe I need to do it for less time? I like my meat well done but not dry. On the plus the gravy was amazing! Has anyone any suggestions please? Thank you. Look forward to trying it again. I have tried this before and all my friends like it. 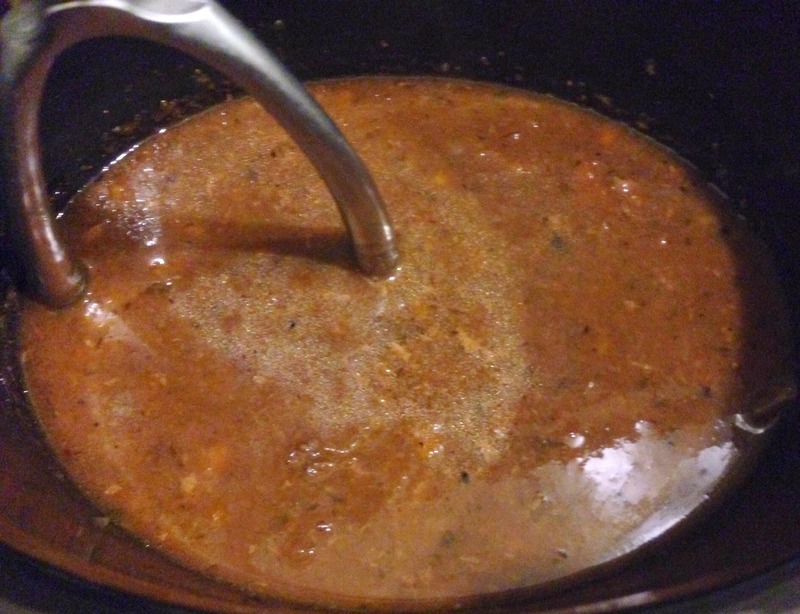 I used a can of oxtail soup instead of water – delicious! And the gravy was too! I normally end up over cooking my beef joint and everyone disappointed,most of all me. This is the best roast beef recipe I’ve tasted. My family loved it. Excellent in the slowcooker. Step by step photos were great. Brilliant and thanks for sharing ! Hey, I am going to try this today. I have one question. Do I need to add the veg for the beef to sit on, or could I cook it without the veg? Thanks! That will save me a trip outdoors! The beef was amazing (moist and full of flavour) today after following your recipe, the gravy was lush too. Will definitely stick to cooking my beef this way. Cooked mine for 5 and a half hrs. Very tender and gravy was delish!! Might try 4 and a half next time. Looks amazing! Am going to try it tomorrow. Thanks for the recipe! Do you have to brown the beef before putting in the slow cooker or can you just put it straight in the slow cooker? Sounds yummy……..let me try it this weekend! Oh thank goodness I’ve found your website !! Just bought a crockpot and tried the roast beef recipe exactly as you wrote it. What a success !! I haven’t cooked roast beef for over a year because I could never get it to be tender enough. But your recipe has changed everything and roast beef is now back on the menu !! Thank you so much. Cooked this for Sunday Lunch today – everyone loved it and kept asking me how much longer they had to wait as they could smell it cooking!! Gravy was fab using the juices and I added a glug of red wine for a little something extra. Forgot how fab a slow cooker is – I think I’ll keep it out ready for next week. Thank you. Will definitely look at your other recipes for further inspiration. Am trying your recipe for the first time today looks amazing cannot wait to try it! Hi, am planning on trying this out at the weekend for friends. Keeping to your recipe but prefer beef to be medium to well. How many hours would you say for a low setting? I have used this method and recipe for cooking my beef a few times now and shall be using it tomorrow for my Sunday roast for when my family arrives for Sunday lunch myself and the family love it . Thanks for sharing your lovely recipe . Lovely! How long do you leave to rest? I used this recipe Christmas Day, excellent. Thank you. Looks tasty and easy to cook. Try this tomorrow ! It’s been quite a few years since I’ve used a slow cooker and am cooking a joint tomorrow. After trawling the net for a decent recipe I’ve stumbled across yours. This seems to be the best one so will use it for my beef. Will let you know how I get on. Thank you. Can we see you recipe to how you use your left over beef for a cottage pie please? Thank you so much!